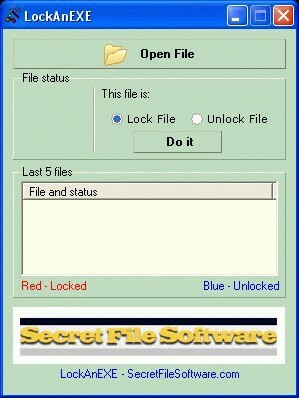 LockAnEXE is an easy to use EXE security tool that offers you the option to "lock" down executable files including setup files and prevents them from being opened. Simply click 'Open File' and browse to the program EXE or the setup EXE. Click the option you prefer and click 'Do It' to lock or unlock the EXE. DesktopKeeper allows to lock your computer by hot key, lock when system idle, lock at specified time. Vinasoft Secret Folder is a powerful and easy to use security application that allows you to protect your most sensitive & secret data files like images, video files, documents, etc.